00:20:00 Makes 8 servings, 1/2 cup (125 mL) each. Makes 8 servings, 1/2 cup (125 mL) each. Planning a potluck? Your new favourite potato side salad was inspired by the classic club sandwich, with cheese, bacon and creamy dressing. 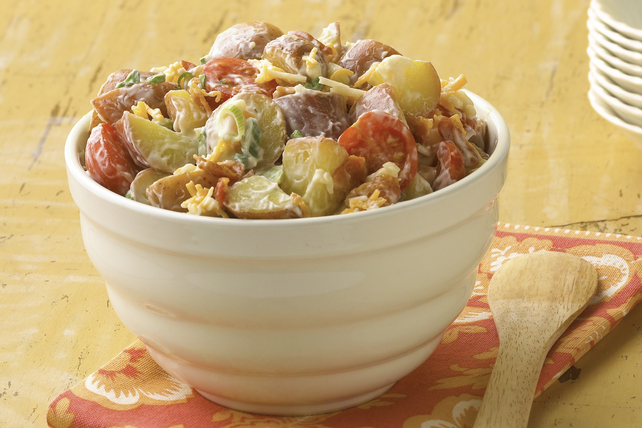 Place potatoes in 2-L microwaveable casserole dish. Add water. Microwave on HIGH 6 to 8 min. or until potatoes are tender; stir. Let stand 5 min. Drain potatoes; rinse with cold water. Drain again. Combine Miracle Whip, bacon, cheese and onions in large bowl. Add potatoes and tomatoes; mix lightly. Serve immediately, or cover and refrigerate several hours or until chilled. Substitute 1/2 cup Oscar Mayer Real Bacon Bits for the crumbled cooked bacon slices. Serving Size Makes 8 servings, 1/2 cup (125 mL) each.